TeamBuilding Unlimited, a Division of Murder on the Menu, has always been environmentally conscious. We try to limit mailings and paper use. All of our materials for all of our events are collected after each event and either reused or recycled. We use energy efficient equipment and tools and carpool whenever possible. Team Building Unlimited has an array of Green Team-Building activities and events that will provide your team with the sensibilities and insights to adapt in today's business world. We will work with your team on genuine Green awareness and actions, teamwork, team roles and diversity, and cross functional collaboration. Our motto: Reduce, Recycle, Reuse, Repurpose, Recharge. TeamBuilding Unlimited will lead participants through a hands-on Green Gardening TeamBuilding event in which they work together to add trees, shrubs and flowers to public spaces, school, and parks. Project Green Thumb will match your participants with organizations that are in charge of these locations, and TBU will provide participants with all the tools, plants, and soil they will need to "Green the Community." The Goal of Project Green Thumb is to establish a community service project that builds relationships through hands-on activities to establish community gardens, provide technical assistance, and provide a valuable service to the community. Consider this for your Earth Day Celebration... or Any Time for Community Service. Give Back. Go Green! This is a variation on our tried and true and extremely popular Corporate Grand Prix. In Top Flight, teams design and "fly" planes that include wings. All planes stay the course, although none actually go airborne! A good thing, since design does not include "landing gear." 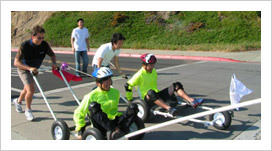 Teams are given identical building materials utilizing PVC Pipe, Connectors, Wheels, Saws, Knives, Markers, Rip-stop nylon, flexible wood, assorted Steering Devices, Parts and more. Team members have an equal opportunity to showcase skills and creativity. 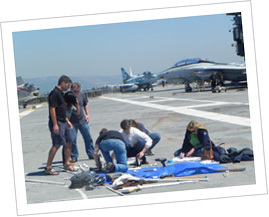 Facilitators brief teams on the challenge and assist throughout the process, but do not aid in construction of the planes. Each plane will have a unique design and ability to "fly" the course. Utilizing recycled paper, cups, and other materials, each team is challenged to build the tallest 3 dimensional free-standing tower. Criteria for success will be given at the outset (ex: must be 5 feet tall, be able to balance an egg, withstand wind or another variable?). Isn't the workplace all about variables? Tower of Power is a great team building activity that will help your team understand the challenges and assets they possess as a team. Tower of Power also addresses working within a timeline as well as material limitations. Process is as important as the Final Tower and will be incorporated into the debriefing based on the team's goals and objectives, agenda and the actual activity in terms of how the work was completed, how the work was designed and managed and how the work was evaluated and monitored. 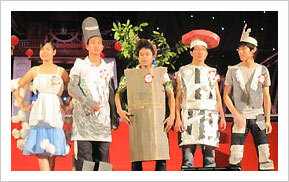 Project Recycled Runway is a fun competition that taps into the creativity and resourcefulness of your group. Teams are given the opportunity to design and construct outfits, walk down the fashion runway, and create a pitch for their fashions that ties back to the goals and objectives and theme of their meeting/event. Participants are the "designers" as they work in teams under time pressure using newspaper, cardboard, garbage bags, cloth, recycled accessories, glue guns, staplers, and duct tape. This is a Green Team Building Event! Teams are judged on quality, style and ingenuity, as well as model ability and spokesperson's explanation. There is never a right answer in fashion, and the final show is always surprising and entertaining. 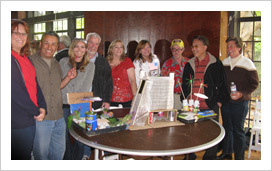 Winning designs/teams will be judged by their peers and "celebrity" judges. Project Recycled Runway is a teambuilding activity that is varied, collaborative, creative and engaging, generating team spirit. Which Team will win Project Recycled Runway? And which teams will be out? This is a thoughtful activity that can be performed in most meeting spaces or outdoors. In these changing economic times, each team is challenged to "seek shelter" (jargon and buzzwords of the meeting incorporated) by building a structure that will protect the entire group. Materials are distributed equally to each team. 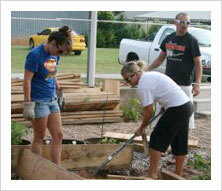 Specific Time is allotted to plan and build the shelter. There are some extra components in this activity that will surprise you. Communications skills (verbal and non-verbal), teamwork and organization. Debriefing on process, leadership, creative thinking, problem solving and ingenuity. This is a green activity and recycled materials are used. Extending the meaning of Green on and off the Green. Recycle, reuse, repurpose materials. Utilizing recycled materials, teams create trophies or centerpieces for a Tournament Awards dinner, Sales Meeting, Special event. An innovative green art experience. Green Art challenge also addresses working within a timeline as well as material limitations. Design, create and build a new innovative Product from the materials provided. The product need not function as a demo but must be explained to the group—What it does and How it Works. Product must relate to the company, the group, and the team. This is a Green Team-building event. Customized prizes for the best invention. Teams design and build a Racecart from identical building materials utilizing recycled PVC Pipe, Connectors, Wheels, Saws, Knives, Markers, assorted Steering Devices, Parts and more. In addition, each team will design a T-shirt that their "racecar" driver will wear during the race. Team members have an equal opportunity to showcase skills and creativity. Facilitators brief teams on the challenge and assist throughout the process, but do not aid in construction of the racecars. Since there is no "correct" way to build the racecars, each racecar will have a unique design and ability to run the course. Upon completion, team racecars will compete against each other in a less than straight course (remember the racecars do not have motors and maneuverability will depend on the skill of selected team driver and "pushers" as well as construction of vehicle). Prizes will be awarded for the team with the most creative racecar design, the new corporate T-shirt, and the team that actually wins the race. Participants work in teams to "design" a piece of a Mural or Quilt that when assembled represents their group, products, company or another theme. Each team gets 1-2 squares to design about their theme and/or company. Deciding on the theme of the quilt or mural is part of the challenge. TeamBuilding Unlimited works with your teams on color palette and technique -but the best part is the creativity of your participants. 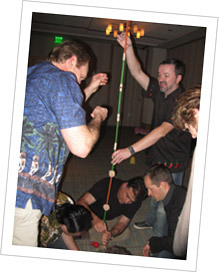 TeamBuilding Unlimited will guide your creativity, provide the materials, and facilitate the event. The "quilt or mural" is then assembled by your teams and can be displayed back at the workplace or donated to shelters, hospitals or other sites. This team building event involves creativity, leadership, strategic thinking, sequenced planning and communication. Mural Making is about Process, as much as art. Facilitators work with the teams to encourage them to think BIG. The final product is a visual documentation of your team's understanding and awareness of the theme they have selected and the process through which they went. Variations: Can be done with mixed media including found objects (recycle, reuse). Goal: Separate parts that add up to one vision! The Big Picture! TeamBuilding Unlimited, a division of Murder on the Menu, comes to YOUR meeting or conference. Anywhere in the U.S.